We are unwaveringly committed to teaching and reinforcing with your children the same values by which you are raising them. We reinforce these values here to prepare them for when they are inevitably faced with a challenging choice. They remember these values, your values, our values and embrace them at that defining moment in order to make better life decisions. Experience a 21st Century Education on an affordable Budget. 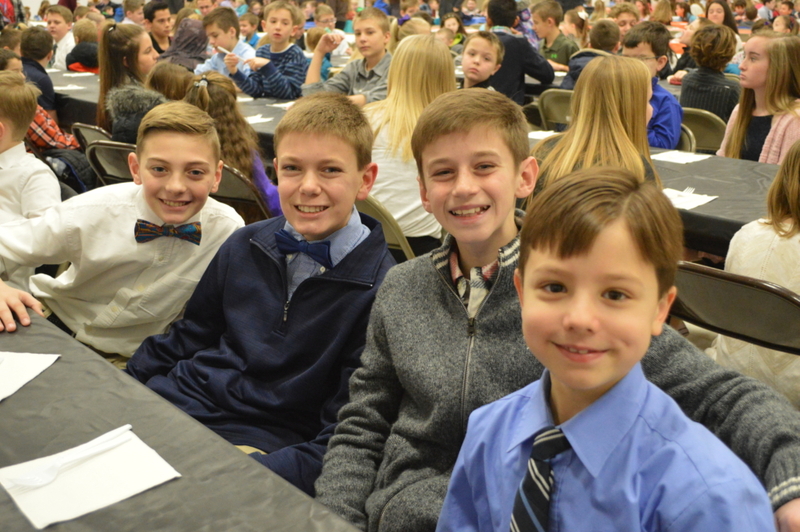 Saint Ambrose School consistently delivers a high quality education that transcends the competition dollar for dollar. Whether it’s a remote fieldtrip in our state of the art Distance learning Lab to NASA, celebrating the Eucharist during school Mass, learning Spanish, working on a STEM cancer project to impact lives, or taking advanced math for high school credit, our students excel. We also offer incredible options to meet the needs of our hard working families which include: before and after care through our Guardian Angels program, extracurricular activities, music lessons and athletics. Think for Yourself and Become a Better You. Beyond teaching Math, Science, Language Arts and other core curricula offered like many other schools, we provide dynamic teaching centered in Christ, an innovative culture, leadership and community service opportunities and problem based learning to enable students to think critically, ask questions, develop a sense of personal empathy, responsibility and public service. We educate the whole child. We are excited to be the first and only STEM designated school in our region as of Spring 2017! Our teachers utilize 21st Century, cutting edge technologies in the classroom and throughout the curriculum. Graduates of Saint Ambrose School are the BEST prepared for the emerging digital world. We have a dedicated computer science and coding program for all students in grades K-8. Saint Ambrose School is the only K-8 school in the State of Ohio and across the nation using Geo Spatial Technology in the classroom and our students and faculty present annually at conferences such as the Ohio Technology Conference and across the U.S. showcasing this technology and teaching methods. ‘Prep’ for More than Just High School. Saint Ambrose School provides a strong foundation of Christian values, academic fundamentals and self-confidence in our students which begins in preschool. We continue this through our elementary program where we build strength of character. Our Bridge program (grades 4-5) helps transition students in fourth and fifth grade for the increased demands of upper grades, building intellectual and emotional tools. By the end of fifth grade, students have learned increased responsibility and independence. HSP program, sixth-eight grade students are prepared to study independently, serve one another and be accountable. Our HSP students have developed the critical thinking problem solving and life skills required to succeed in high school, college and beyond. Something extraordinary occurs at Saint Ambrose School – in the proud smiles of our teachers when a student achieves beyond their own expectations; in the lifelong friendships parents develop with one another; in the voice of a mother sharing how her Littlest Angels preschooler wants to say a prayer before dinner each evening – and this feeling reminds you that you really are part of something truly special here…and you always will be.